And for the border, feel free to use any color or colors you like, or you may prefer to simply extend the hexagons and have no border at all. 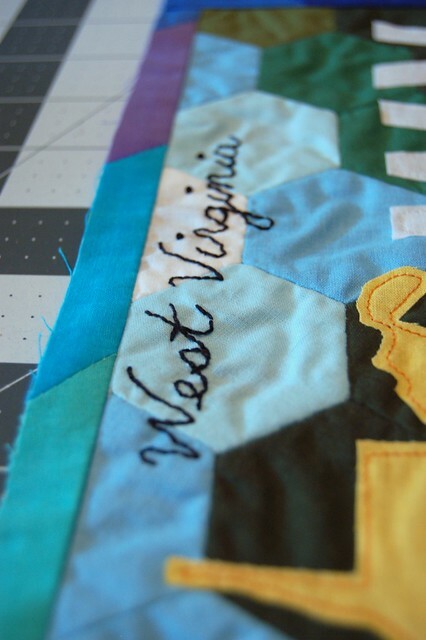 For truer WV colors, I might have made the border in solid Light Navy. For this plate, (clockwise from upper left) I used Aqua, Dark Turquoise, Dark Aqua, Purple, Dark Blue, Light Navy, Dark Purple, Periwinkle, Dark Fuchsia, Dark Tomato, Orange, Light Yellow and Light Denim. 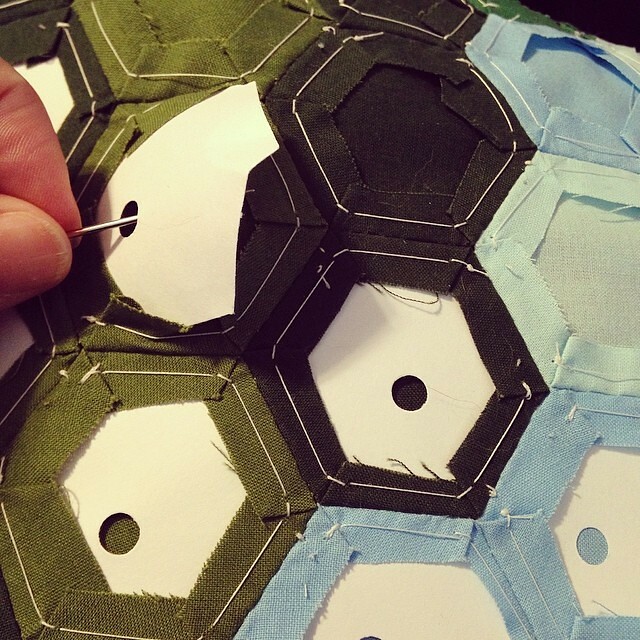 The background begins with English Paper Piecing using 1″ hexagons. 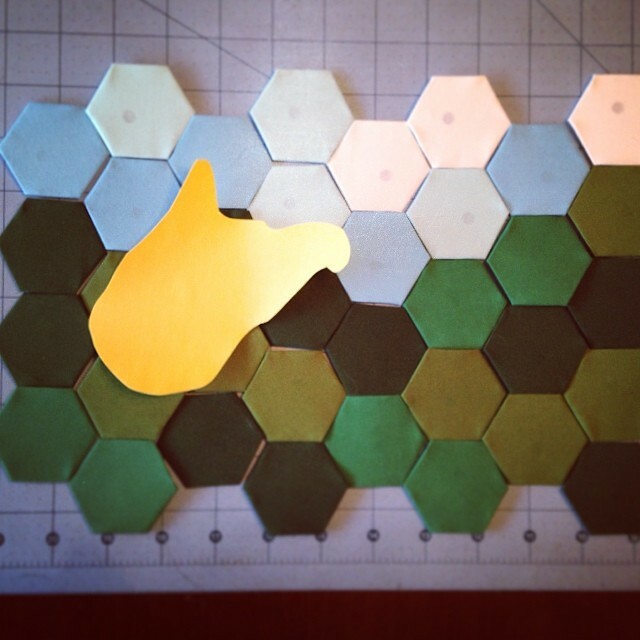 I ordered my template papers from Etsy. 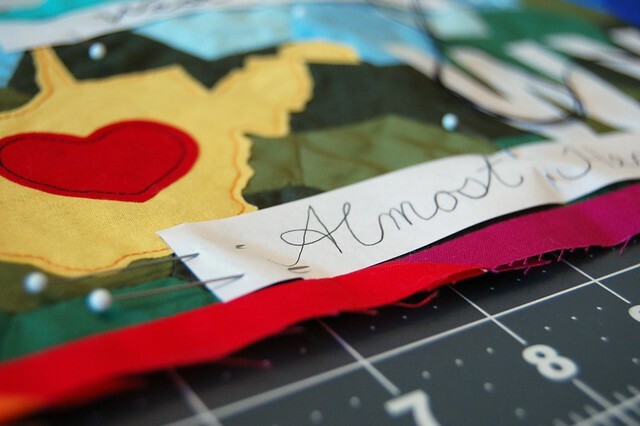 If you haven’t done English Paper Piecing before, there’s an excellent tutorial from Jessica at Life Under Quilts that can be found HERE. This is an easy and soothing sewing form that doesn’t require a sewing machine, making it great for travel or even sitting in front of the TV in the evenings. 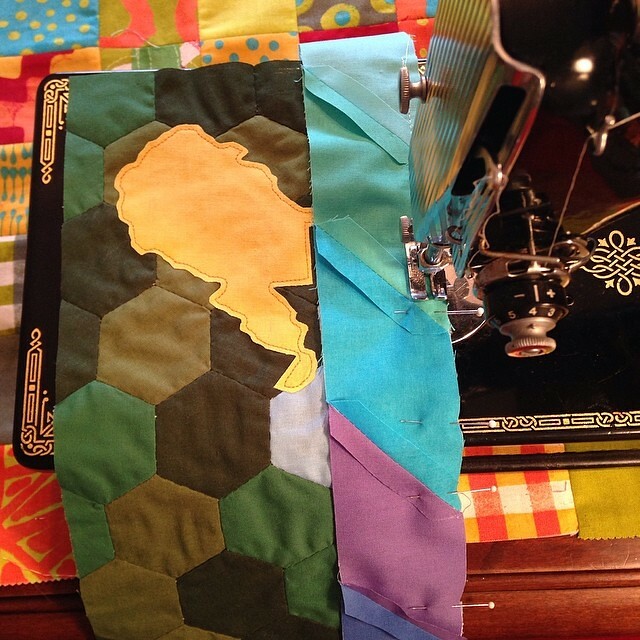 Lay out your hexagons in rolling hills and blue skies to be sure you like the placement and size, keeping in mind that the finished plate size will be 6.5″ by 12.5″. After sewing them together, I cut my hexies down to 6″x11″ to make room for a bit of border, but you could choose to skip the border and trim to 6.5″ x 12.5″ at this point. Oh, and just a tip about English Paper Piecing — before I use my templates, I use a hole punch on each of them. Then I can easily pop out the templates from the finished piece with a large blunt needle. 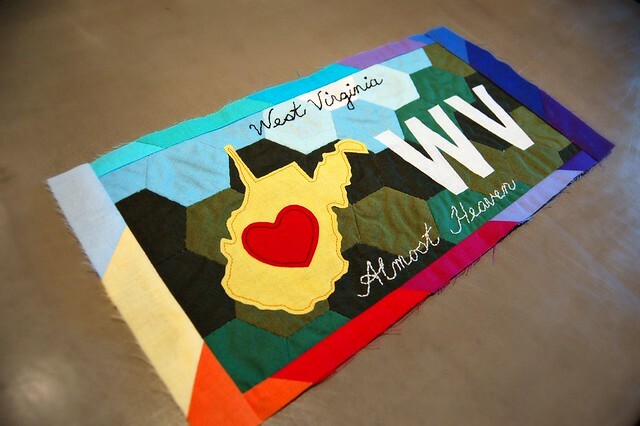 Trace the backwards West Virginia outline onto some light, sewable Heat n’ Bond. 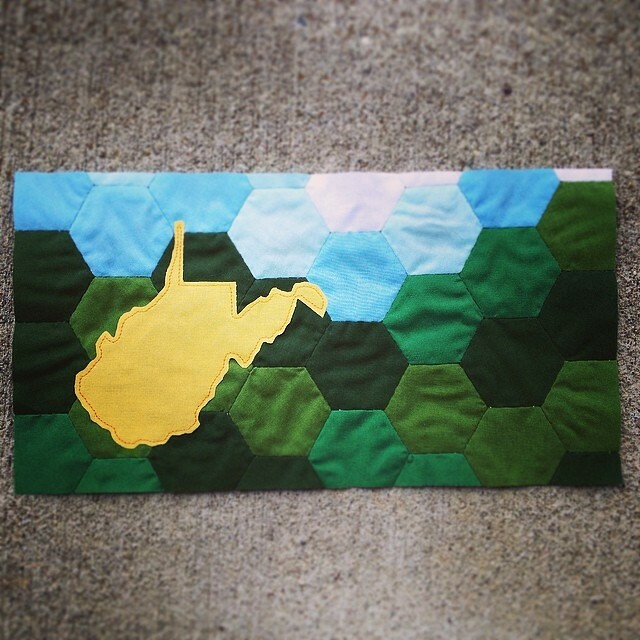 (Kristin from Sew Mama Sew made a great tutorial for fusing fabric in this way.) Roughly cut the shape out leaving a border of extra paper all the way around and iron to the wrong side of your fabric using the instructions on the package. 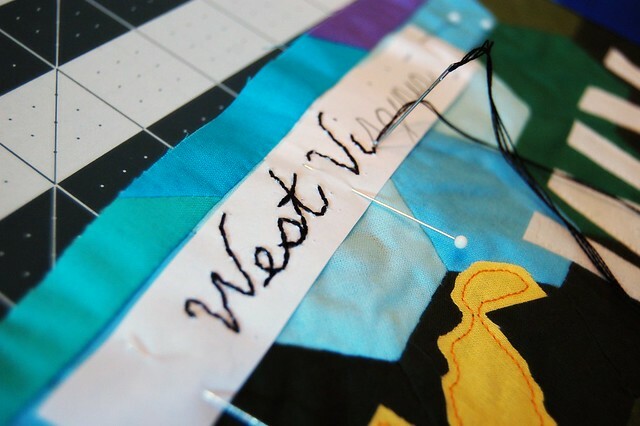 Once it’s applied to the fabric, trim neatly around the WV border and iron it in place on your background. Stitch carefully around the outline with a very short stitch length about an eighth of an inch inside the border, or using a zigzag stitch that overlaps the edge. Since this is for a “display quilt” that is unlikely to go through a washing machine frequently, if ever, I didn’t worry about the fabric fraying and didn’t overlap the edges. then stitch right through the paper with a couple strands of embroidery floss. I used the font “La Belle Aurore” from Picmonkey, at a little under an inch tall. Feel free to change up the wording or font, or to leave them off all together as you like. “Wild and Wonderful” is another WV slogan I like. “Open for Business” is a slogan I never cared for, but there it is. 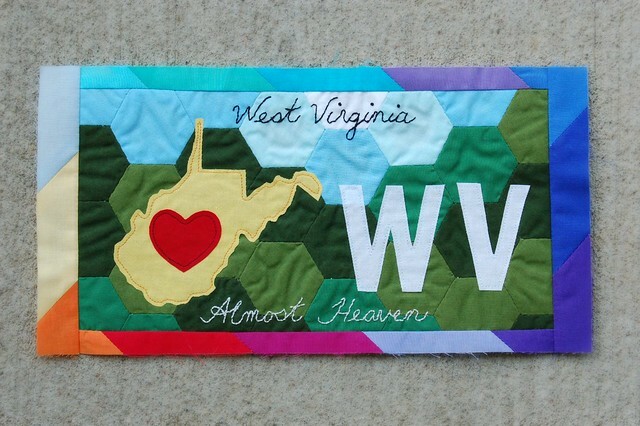 Finish the lower lettering in the same way, and you’ll have a beautiful West Virginia license plate ready to add to your quilting project! If you make one, I would LOVE to see it! I really like your hexies. You did an excellant job and I love your plate! It is the best I have seen! Great job as always!